The Ghost: Remember that time when City could bring in World Cup winners for £50K? As far as the study and appreciation of Art is concerned, I am, and will forever be the type of person who the artistic cognoscenti would look down their long, thin noses at, regarding me and my simple appraisals of the great works as opinions that matter less, to them, than those of, say, an Orang-utan. I like what I like. If that’s because it looks “real” or the woman with hardly any clothes on it is a bit of a looker, then that’s why. Simple really. And, for those and similar reasons, I tend to like anything done by J.H.Waterhouse for example. On the other hand, someone like Damien Hurst, all diamond encrusted skulls and pickled sheep, it’s not even a case of ‘take it or leave it’. I’d definitely leave it. And, most of it, I have to say, out for the dustcart where it belongs. Staggeringly, some of Mr Hirst’s pieces have been sold for truly astronomical, even surreal prices. One piece, called The Golden Calf (yep, it’s a calf in formaldehyde…with added gold) sold for £10.2 Million. Which is not that much more than Norwich paid for Ricky Van Wolfswinkel. Somehow, I don’t think he’ll appreciate quite so much if he’s left in the Tate Gallery as much as Mr Hirst’s efforts will, but there you go. An interesting comparison and one which adds fuel to the fire of thought that, in general, the more money an item costs, the less likely it’s real value will be anything near it. Because, like it or not, just as £10 million pounds plus is a ridiculous, laughable and obscene amount of money to spend on a pickled ruminant, then it also, most certainly is, an equally stupid amount of money to spend on a footballer even if, in this day and age, it’s now considered to be small potatoes in terms of outlay. However. That is how things are, market forces in the game dictate that you have to pay big money for greater perceived quality and there is nothing we can do about it. Now, regardless of whether Ricky or anyone else was ever worth that sort of money or not (he wasn’t – Ed), it does strike me that the days of acquiring a bargain, both in the art world and footballing one, are fast drawing to a close. Most of us are guilty of turning up at our local car boot sale in the faint hope that we might espy something that someone is desperate to get rid of – but which in our eyes is something of immense value, an item we would be only too pleased to spend £6 on (but still trying to get them down to a fiver) before triumphantly heading home with our loot; the call to Sotheby’s already being formulated in our heads. My car boot sale dream item would be a programme from the 1962 League Cup Final between Norwich and Rochdale – either leg. I’ve heard tales of lucky collectors who have done just that, picking up said item for a couple of quid, the (unfortunate!) seller probably only too pleased to have got rid of it, little realising its true worth. For, and if you’ve got a copy, take a deep breath now, it is now one of the most valuable programmes around-the one for the game played at Spotland is the rarest League Cup final programme there is, valued at around £1,500 by most reputable football programme sellers. If you came across one, would you hand over your 50p for it without a murmur-or would you have a quiet word in their ear and let them know what the item, previously regarded as useless and past its best was really worth? Which was precisely the dilemma Canaries manager John Bond found himself in back in 1975 as he found himself trawling football’s very own car boot sale – the list of players available at bargain prices prior to the closing of that season’s transfer window. Unlike now, the window had remained open since the previous summer, only briefly closing (or “slamming shut” as it now seems wont to do) in April for the remaining weeks of the season – a much more satisfactory arrangement than the focused frenzy we all endure now and one which left time for casual browsing. Which is exactly what John Bond was doing. When he first heard that Tottenham, Norwich’s opponents that week, were prepared to part with Martin Peters; English football’s very own artist, a visionary midfield maestro who’s sum of works included the sort of life stopping moments that Damien Hurst could never replicate – including not only a ‘mere’ appearance in a World Cup Final but scoring a goal in one – he must have been sorely tempted to take Terry Neill, the Tottenham manager, to one side and ask him if he understood the magnitude of what he was doing? Except of course he didn’t. The most hastily drawn up, signed, sealed and delivered cheque that any Norwich chairman will ever sign, one for just £50,000, was handed to Neill and, in a state of what must have been sheer disbelief, Bond brought his steal back to Norfolk with him. Daylight robbery? You bet. Bond could have had the Mona Lisa in the back of his car, but it would not have been so much of a bargain. He had, quite simply, pulled off the greatest piece of transfer business in Norwich City’s history and not only up until that day but to this one as well. Never had, or has there, ever been a better piece of business done by this club. So what did Norwich get for their money? Experience? Certainly. Over 300 League games played for West Ham United, all in the top flight, plus another 189 for Tottenham. Add to that 67 caps for England, during which time he had scored 20 goals, none more famous than that the one scored against West Germany in the 1966 World Cup Final. A World Cup Winners Medal – what chance now have Norwich ever got of buying a player with that sort of pedigree? Limited, at best. Yet there’s more. Peters had winners’ medals and big game experience in the domestic game as well as that in Europe – one each in the European Cup Winners Cup and UEFA Cup as far as the latter was concerned. He’d previously been transferred for a British record fee and had, famously, been described by the England manager, Sir Alf Ramsey as being a player “ten years ahead of his time”. Amongst his fellow players and supporters, he was known as ‘The Ghost’, a sobriquet that referred to his unerring ability to drift, unannounced and unseen, into goal scoring positions-which he did frequently for both his former clubs, 117 times to be exact. He was the model player, a goalscoring midfielder who, as well as being able to take the chances offered up to him, was equally able to make them with his unerring ability to read the game from a book that none of the other players on the pitch would have. Ahead of his time as Ramsay had said and in so many ways. Yet here he now was, still only 31, and signing for Norwich City. A modern(ish) day parallel was perhaps that of Frank Lampard. Lampard was the sort of player we could have done with against Switzerland last night, a midfield goalscorer of some repute and, if he lacked the World Cup Winners medal that Peters had, he still had the next best thing – a Champions League one. But, despite all that experience and ability, would, as he wound down his career at Chelsea, Norwich have stood even the slightest chance of signing him, just as they had with Peters? The game was different when Bond signed that decades-old version of Lampard of course. His wages, upon signing for the Canaries were similar to those he had been on at Tottenham. And, as for his chances of winning something? Again, probably similar. Norwich ended the 1975/76 season, their first back in the top flight after a one-year hiatus, just one point behind Peters’ erstwhile side. If we had done that in any of our recent sojourns to the Premier League, we’d almost certainly have qualified for Europe – and probably in the Champions League. Like I said, football was different then. 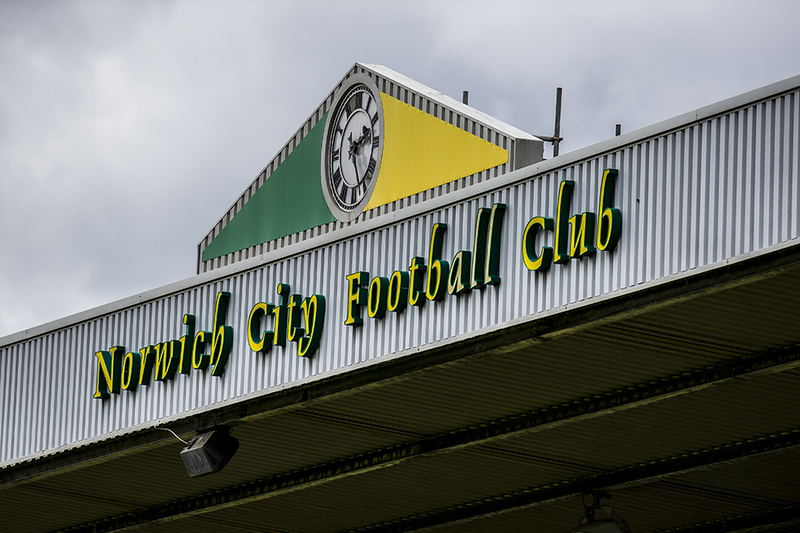 Bond’s eternal gift to Norwich City will be that he took the Canaries into the modern age, made the club more professional, more high profile, more, for want of a better word, serious-both about itself and its ambitions and its place in the footballing hierarchy. The reputation we have long had for being a good footballing side, a passing side that is attractive to watch dates back to Bond. He was, without question, the spark that lit the flames which warm football fans to Norwich City to this day. But he couldn’t have achieved half of what he did at Norwich without Peters. He made his Norwich debut on March 15th, 1975 in a 1-1 draw at Old Trafford, a member of an attack-minded side that Bond had sent out against the (Division Two) leaders that also included Ted MacDougall, Phil Boyer and Colin Suggett. From that day on Peters was more or less a permanent fixture in the Norwich midfield. His last game for the club, a 4-2 win over Derby County on the last day of the 1979/80 season was his 232nd league and cup appearance for the club (more than he had made for Tottenham), the Norwich line up on that day featuring only one of the players that had appeared for the club in his debut match over five years previously – Peters himself. He had even, during that time, been heavily backed for an England recall, such was his form and finesse for the Canaries, as well as his sheer presence on the pitch, one which the likes of Kevin Reeves and Justin Fashanu could only benefit-as they surely did. Yet, despite the support for his international recall – which came from all sides-players, managers, media and fans – he did not get the opportunity to wear the England shirt again, the ‘official’ reasons for his omission being that England were looking to the future and wanted to focus on promoting the younger players rather than reverting to those from previous years and regimes-especially Ramsay’s. Which made the international call-up of Liverpool’s Ian Callaghan in 1977 – when Peters was at his Norwich pomp – all the more galling. For Callaghan, then 35, and who played in the same position, was nearly six months older than Peters. Then, as now, it didn’t seem to be what you were but who you played for. Oh for a Peters in the side today. And all for just £50,000. A drop in the transfer ocean even then, let alone now. So yes, it is exciting, tantalising, a sign of progress even, that we now have a football club that until the recent round of austerity was willing and able to spend 100 times that amount on a single player. And, no doubt at some point they will again. Whoever that is and whenever it does happen, I look forward to welcoming them to the club, seeing them make their debut and having a long and successful time spent with us at Carrow Road. Happy days! I particularly remember a sumptuous dummy in front of the Barclay to leave Steve Grapes a tap in (can’t remember who we were playing). What’s the £50k fee in today’s money? I’d guess £3-5m. Only madders matched MP’s ability, and for a similar fee, but today we got the cash instead of the long service.. Under half a million actually, around £407k on official figures. That feels about right given that my first ever salary as a deputy junior assistant accounts clerk was £1,700pa around that time, which is equivalent to about £13-14k now. But of course, football inflation is massively ahead of normal RPI, especially in the past 10 years. And don’t forget Terry Neil didn’t have to pay 7 substitutes a decent whack to sit on the bench every week. Had the rules then been as they are now I doubt if they’d have let him go. Thank you so much for that, brought back some terrific memories. I remember the day clearly, I was at work someone had either got a whisper of read something, he came back from the City saying looked like Martin Peters was signing. My initial response to call him a liar and to stop winding us up. He know all too well that Mr Peters was my favourite player of all time up to then, a hero from 1966 when I was just 14. I have to say that I feel honoured even to this day to have seem Martin Peters play for my team, and I got to meet him too. I look back and wondered why I never wet myself with excitement. He was drawing to close of his career, but still he could ghost in, also he was still ahead of some of our players in his vision. Additions in later years that came quite close to Martin Peters, was Mike Channon & Jimmy Neighbour but my hero was never beaten as being my best ever City signing . It was strange to see him play for Gorleston once he came back from managing Sheffield United alway a class act for all the clubs he turned out for. Waterhouse is one of my very favourites. I still have the Ladie of Shallott over my fireplace to this day. I got it from the original Tate 40 years ago as a print which was quickly professionally framed and has been in situ inside at least five different houses of mine ever since. I was lucky enough to be given a original press photograph (black & white of course!) of ‘The Ghost’ scoring that 1966 goal and what a stunner it was! Peters was without a doubt the finest ever player to pull on a yellow and green shirt. That really brought back some great memories. Martin Peters never seemed to be in a hurry, always seemed to have plenty of space, and always seemed to make the right pass. Simply the best player ever to pull on a canary shirt. John Bond a real Norwich City legend. He really started City playing some great football and his interviews were always worth listening to. I’d forgotten just what a ridiculously low sum (even by 1960s standards) we paid for KK. We sure got our moneysworth! Oh for a John Bond now. Peters was pure class. Don’t forget he was really only 21 when we signed him!